Choice of Models - Ultimail 60 with speeds up to 60 letters per minute, or for maximum throughput choose the Ultimail 90 with speeds up to 90 letters per minute! Use the Ultimail Franking Machines on their own for minimum footprint, or add one or more of the hardware options to provide the functions you need. Up to 25 different configurations are possible! The optional interface allows the postage amount to be set automatically from one of our linked MH Series Postal Scales. This has obvious convenience, saving the time taken to key in the franking amount. These price computing postal scales will help you to cut through the maze of Royal Mail and Parcelforce rates and services, not only giving the exact postage cost, but also helping you to save money. If your daily throughput is lower, typically 20 - 100 items of mail each day, you probably don't need such a fast machine. The OptiMail is an ideal franking machine for the busy office which also has the convenience of interfacing to the MH Series Postal Scales. 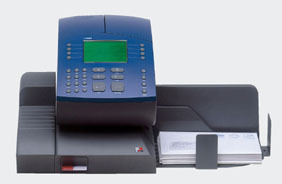 If you want the ultimate in sophistication, take a look at the JetMail franking machine. Return to Franking Machines main page.